This project is designed to address the requirements (issue 142) for aliasing the RESTful interface. Leveraging an "alias" (to the RESTful end-point) enables the deployer to abstract the implemented resources / contexts and present a consistent URL that can be maintained should the actual RESTful end-point change. The current REST interface is quite flexible, but embeds details of the internals of the OpenPTK configuration in the URI. This planned implementation of this is to be implemented as a servlet filter which simply looks for request patterns and redirects the requests to the actual resources in the existing REST interface. 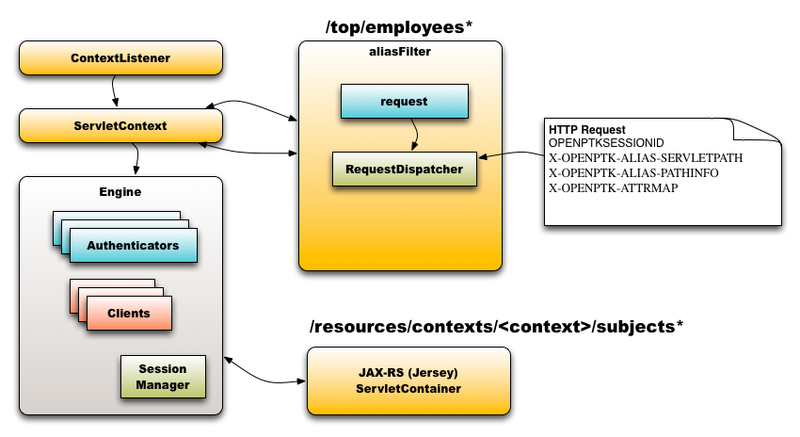 The design will use javax.servlet.RequestDispatcher in order to preserve the request and process the resonse, while ensuring that authentication and authorization are not negatively impacted. Using a servlet filter will also provide flexibility in the URI path that is used for the alias, without requiring configuration in the web.xml file. With this approach, the new top level pattern would need to be selected. <alias> in the examples above was only used as a placeholder. The actual string itself could also be configurable, but we will need to select a default. The Aliases "end-point" can not be any of the reserved values. Two different Aliases can reference the same target URI. This feature will allow multiple aliases to be created, that each point to a different real context, or two different Aliases can reference the same context. In this example, <alias-root> is a single top top level pattern (/top) and /employees is an alias mapped to the context (Employees-Embed-JDBC). In this example, <alias-root> is a top top level pattern (/top) and /v1/customers is an alias mapped to the context (Customers-OpenDS-JNDI). The implementation of a servlet filter would require that this filter would fire first in the filter chain before authentication and authorization. The configuration in the openptk.xml file of the aliases would only require a simple entry in the configuration file to associate an alias with a specific context. The configuration will optionally include details for the attribute mapper to use for the request.